December is generally a frenetic month for most of us – whether planning for Christmas and family gifts, working to securing end of year targets and of course, responding to demanding customers anxious about receiving their purchases on time or getting the latest and best deal for their gift of choice. Patience and consideration of others can often be left at the door when customers are trying to connect with organisations at this busy time of year. The trick in managing surges can be knowing when and how to flex to try and make sure that standards don’t slip, and customers don’t suffer. For me this was evident during another busy week of member events where building resilience in our teams in the face of external complexity and uncertainties was the key theme. 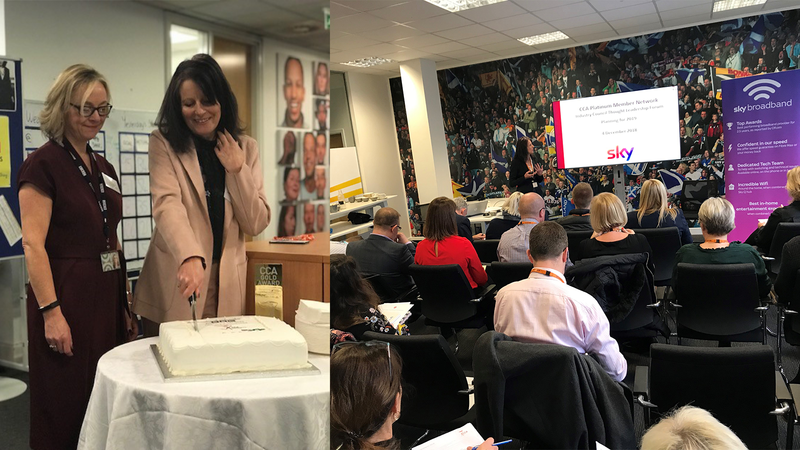 Kicking the week off with our final Thought Leadership Forum of 2018 hosted by CCA award winners Sky, we heard about their innovative approach to progression and development with the ‘Step into Management’ programme; an initiative designed to allow their top talent in the business to shine. The programme offers the opportunity to learn, develop and prepare for leadership roles whilst at the same time keeping a finger on the pulse of the customer offering a great balance for the individual and the business. Belfast was next on my tour where CCA Centres of Excellence delegates were hosted by Capita BBC. As one of our longest standing accredited centres, excellence is very much a habit in Audience Services. Receiving a Gold Award for 15+ years of continually achieving CCA Global Standard© I was delighted to showcase this amazing centre whose advisors deal with issues on anything from Brexit to the latest storyline in EastEnders. Specific skills and attitudes are required to succeed and be helpful but impartial, even with angry customers who demand an answer to a question that perhaps doesn’t actually have one! Rounding off the week was our People & HR Forum back at CCA HQ chaired by broadcaster and expert consumer journalist, Liz Barclay. The discussion focused on emotional intelligence and how we can best support our teams to thrive and survive in our ever-complex world of dealing with customers. From the many conversations we had this week with over 40 cross sectorial organisations, all are keen to accelerate progress in building the right talent in tandem with these new digital systems. Balancing that with clever investment and creating the right partnerships is the nirvana we all seek as we strive for making excellence a habit. We have one more session next week to help you prepare for 2019 where I’m talking to Dr Natalie Petouhoff from Salesforce to review 2018 and think about where the focus needs to be for 2019. Please join us and register here. After these last three sessions of 50+ events through 2018, we did our own customer experience measurement. In particular, what should we do more/less of to lead our industry during turbulent times? One particular area coming through loud and clear was the need for a new collaborative service for members to have authentic discussions about technology supplier options when seeking to procure new systems. We heard from members about shortcomings and lack of joined up partnerships, in technology implementation phases, leading to misery for their customers trying to access phone and digital services. So we have loads to be getting on with and plans for 2019 are well underway. To have your say and bag an early Christmas goodie, click here to register for the full CCA programme for 2019 which will be available next week in time for Santa wish lists!